Some days, I crave gelato. 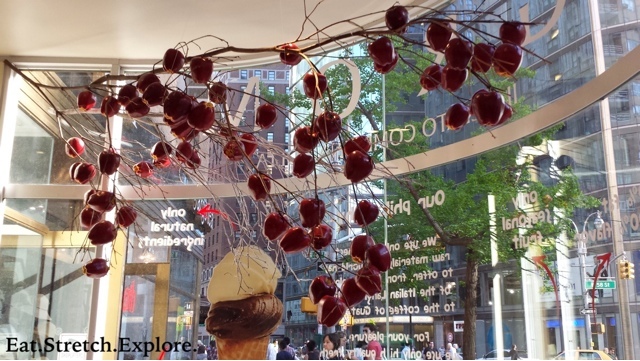 I really enjoy Grom in Columbus Circle, Manhattan. Grom is in a really convenient location to Central Park. Grom prides itself on being 100% natural and uses no artificial coloring, flavoring, or preservatives. The flavors offered change monthly and there are multiple size options to choose from. Grom is a little bit more expensive than other gelatos in the city, but they use much better quality ingredients. After choosing your favorites among the roughly 20 flavors, you need to also choose if you want a cup or cone. As if that was not challenging enough, they also offer affogatos and shakes. If gelato is not your thing, they also offer fruit sorbets, so there is something for everyone. There was a long line when I went, it was one of the first nice weekend days in spring in the early afternoon after brunch. We waited for a while outside. One of my friends saved us a table outside while another friend and I waited in line and ordered. In the store, there are a few small tables, maybe about seats for 8 people total. There are little bistro tables out front of the store and there are also other areas to sit in the little pedestrian area outside. If you can't find seat, you can easily walk to Central Park 3 blocks away and take an afternoon stroll. The gelato is very fluffy (? ), not hard like some other gelatos I have eaten. 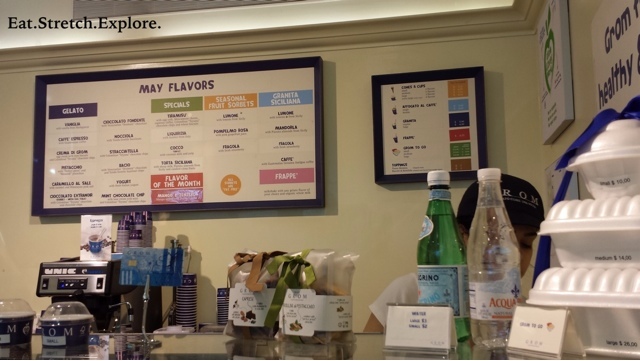 I ordered the salted caramel flavor and tiramisu flavors in a small cup ($5.25, up to 2 flavors). The tiramisu's espresso flavor is strong, so I was pleased about that and the chocolate pieces are very high quality. The salted caramel (my favorite flavor) was not overwhelmingly sweet, so I was a super fan of that. The salt they use is Himalayan pink salt, which I think is pretty unique, so it's worth a try because of this different flavor note. 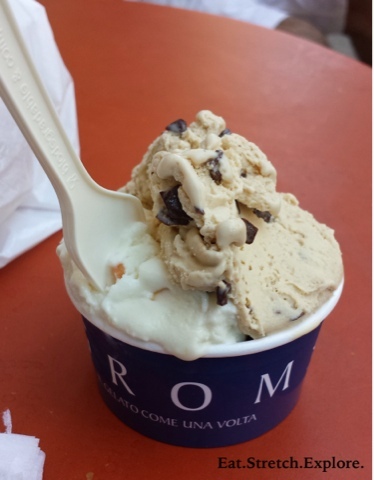 Grom's bacio flavor is chocolate hazelnut, so it's basically Nutella gelato, if that's your thing. Grom is an Italian chain and they have a few stores in the City. I went to the Columbus Circle location. It is located right outside the subway station exit (59 Street - Columbus Circle station, 1) by the Kinko's, on the corner of 58th Street and Columbus Circle. There is also a location in West Village (233 Bleeker Street) and one on the Upper East Side (5th Ave and 72nd Street).